Near-infrared (NIR) spectroscopy offers users the capability to make rapid ID or quantitative measurements for a multitude of applications. Additionally, an essential feature for NIR use is the ability to transfer successful calibrations to other NIR spectrophotometers. Many manufacturers who use NIR for raw material identification and/or quantification of components in materials have the need to utilize multiple NIR spectrophotometers throughout their facilities. In these cases, it is essential to be able to develop calibrations using spectra generated on one NIR spectrophotometer and then transfer the calibrations to other NIR spectrophotometers at different locations. Another situation necessitating efficient calibration transfer occurs when manufacturers may need to replace outdated NIR spectrophotometers but still want to minimize time and resources by adapting the functioning calibrations that are in use. Such transfers allow users to reproduce existing NIR methods or replace older hardware platforms with minimal effort. In achieving transfer, there must be consideration for the type of instrumentation involved in the transfer, software tools available, calibration development, mathematical transformations, and model optimization. 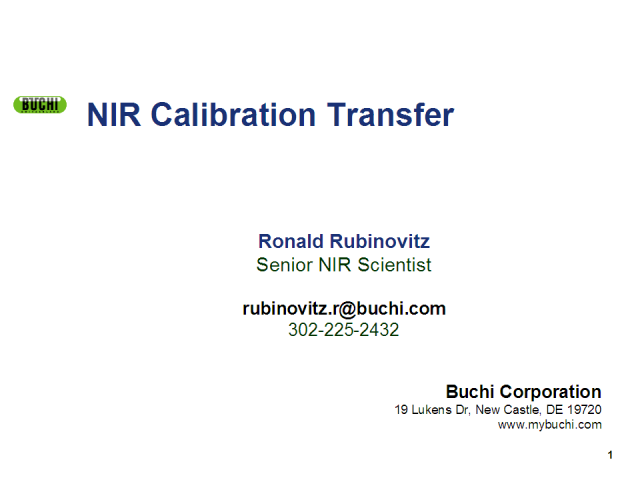 In this presentation, specific examples of calibrations transferred to Buchi spectrometers will be used to present a methodology for effective NIR calibration transfer across either identical or different vendor hardware platforms.